The Rearguard Falls viewpoint provides an excellent opportunity for travelers to witness the end of a long journey by the Chinook, largest of the Pacific salmon. These fish have survived several years at sea to return to the river of their birth, the mighty Fraser. From its estuary in British Columbia’s lower mainland to this point, the Chinook have traveled upstream over 1200 km. Some may be successful battling over these falls to reach the gravel above, but for most, Rearguard Falls marks the end of their journey. Help protect the park land. Enjoy Rearguard Falls Provincial Park but please leave it as you have found it so that future visitors may also enjoy the park. No alcohol is permitted in the park. For safety reasons, firearms are not permitted in the park. Rearguard Falls Park is closed to hunting. Children should be supervised. The viewing area drops off steeply to the river. The water here is extremely cold and fast moving. Spray from the falls can reduce visibility and make adjacent rocks slippery. For your safety please remain within the fenced area and enjoy a safe visit. There is one trail to a viewing area of Rearguard Falls. For your own safety and the preservation of the park, obey posted signs and keep to designated trails. Shortcutting trails destroys plant life and soil structure. This park has a small viewing area to look at the waterfall. In the Fall, visitors may see runs of Chinook salmon, as this is the end of them on the Fraser River. 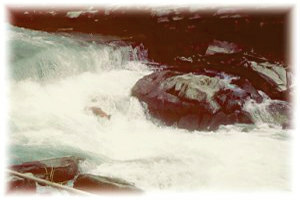 The falls are usually impassible for the salmon as they are too high for them to jump. During winter, visitors can snowshoe on the walking trail to the falls. No firewood available. Firewood can be purchased outside the park or you can bring your own wood. Fees for firewood are set locally and may vary. While campfires are allowed and campfire rings are provided at each campsite, we encourage visitors to conserve wood and protect the environment by minimizing the use of fire and using campstoves instead. Limited burning hours or campfire bans may be implemented. To preserve vegetation and ground cover, please don’t gather firewood from the area around your campsite or elsewhere in the park (this is a ticketable offence under the Park Act). Dead wood is an important habitat element for many plants and animals and it adds organic matter to the soil.